It’s hard to imagine S’mores could get any more fun. But one jig of this new Pole from Firebuggz and you’ll be hooked. This roasting pole is built to withstand years of family fun. Makers Bob and Tara Hurt of Becker, MN, call it Fire Fishing. The wooden handle has the feel of a fishing pole, but the rod itself is made of steel so it won’t catch on fire (or catch fish). What it will do is perfectly roast marshmallows, hot dogs, and more. Simply flick your wrist like you’re fishing to flip food and roast evenly on both sides. The stainless steel rod is as easy to clean as it is to use—just wash with soap and water. Formerly a landscape designer, Bob is always looking for family-friendly ways to fire up the fun in outdoor spaces. He and Tara had kids in mind when they included a built-in safety mechanism to control rod swing. Perfect for backyard firepits, beach bonfires, and camping trips, you can roast up to four marshmallows or two hot dogs per pole. We’re willing to bet that the kids will each want a pole of their own. 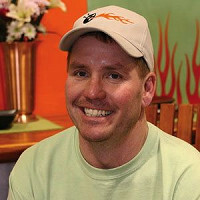 Hi everyone, my name is Bob Hurt and I am the Founder of Firebuggz. I am truly passionate about helping you enjoy your outdoor space -- and hope we can help you create some fun memories with your friends and family, whether at home, the cabin or just hangin out with friends! Hi Bob, I have been a girl scout leader in the past, for several years and boy these sure would have been nice to have with 15 girls... 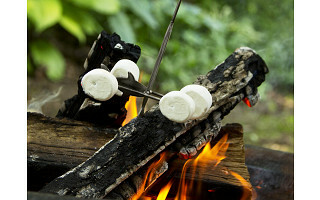 I have always loved smores and still today we make them in our fire pot with my youngest son. He loves them so much! Nothing like sitting around a camp fire after going fishing all day and catching your boat full of Brim! Best of wishes to you with your new product! Thank you so much Marcie. It is kind comments and motivation from people like you that make my job truly enjoyable. Enjoy your time with the kiddos and keep creating those special memories. Happy Fire Fishin'! How do you get even cooking? This is a great question, and one that I'm sure others might wonder as well. 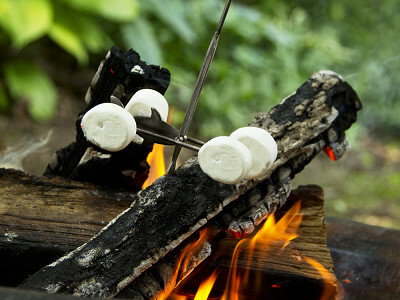 Firebuggz works similar to roasting marshmallows in that you simply hold it over the fire evenly, and the flipping process is what will allow for even cooking on both sides. Bob, the founder is online now and will likely jump in with his personal opinion soon. The Fire Fishing, Pole has a patented mechanism that when you jig the pole like you are setting the hook fishing the weight automatically rotates your food to ensure you get both sides done perfectly. It is so much FUN, which is why I created the idea for you and your family to enjoy. Thanks for the great question! Great question Lisa! 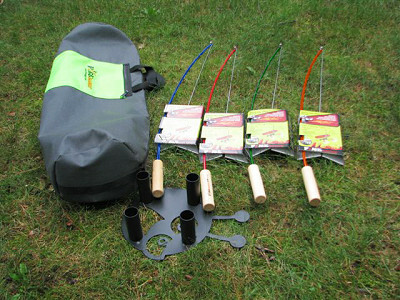 On the directions as well as our website you get with each product it states that the lower 6" of the line area will get hot but the upper 12" will remain cool to grab and hook line onto the rod sections to safely remove and reload the hook area. Just do a dry run to ensure you can hook it correctly. Thanks for the great question. The entire line section is stainless steel so it will not rust or corrode. @Carol If your comment is directed at the team at The Grommet, we kindly thank you. And if it is directed at Bob...he will be thrilled too. Yes Carol and Jules, the Grommet team is simply amazing and we are lucky to be working with them! Awesome job! What a wonderful idea. So surprised someone hasn't thought of it sooner. Thank you for your kind comments, it all starts with an idea and the belief that you can do it! Its people like you that make inventing things FUN! I hope this is ok to ask - do you offer wholesale purchasing? We own a campground and would be interested in reselling these in our camp store. Thanks! @Sydney Hi Sydney, Aaron from the Grommet here. Let me put you in contact with Bob directly so you can discuss further. This is a great idea! However, the price is outrageous. I would need six. We'll just keep using the free sticks out of the woods. And, it's too bad. I really like these. You could always start out with a couple, these are way more FUN than sticks. We pride ourselves with building a very high quality product. The stainless steel will last forever, so it is a very small investment for something that will last forever. Thank you for your input and have a great summer with the family and kids. Hi there!! I like to think of myself as a marshmellow roasting guru! :) I love to do it nice and slow to get it nice and brown and crispy. I find that wooden sticks work the best for this versus the metal ones. Just curious if the marshmellows stay on your fishing poles very good when doing a slow roast? I would love to find another great way to roast as sometimes it is a pain to hit the bush for a stick. Actually the marshmallows very rarely fall off the fire fishing poles. We have sold over 60,000 units and have only had 3 returns due to the quality of the product. I too love a perfectly crispy marshmallow and these poles satisfy my taste buds, plus they are way more fun than a branch. It’s hard to imagine S’mores could get any more fun. But one jig of this new Pole from Firebuggz and you’ll be hooked. This roasting pole is built to withstand years of family fun. Makers Bob and Tara Hurt of Becker, MN, call it Fire Fishing. The wooden handle has the feel of a fishing pole, but the rod itself is made of steel so it won’t catch on fire (or catch fish). What it will do is perfectly roast marshmallows, hot dogs, and more. Simply flick your wrist like you’re fishing to flip food and roast evenly on both sides. The stainless steel rod is as easy to clean as it is to use—just wash with soap and water.